Chocolate is chock-full of antioxidants--flavonols and polyphenols in particular. Dark chocolate contains the most of these mood-boosting substances and can lower cortisol and blood pressure. It is also found to be more satisfying than milk chocolate because a little bit goes a long way. Combat stress with creamy avocados. They contain a substance called glutathione, which blocks certain fats that can create damaging oxidants from being absorbed in the intestines. It’s also rich in folate. Garlic, Onions, and Leeks, Oh My! These foods are part of the allium family and contain high amounts of allicin, an antioxidant that can neutralize free radicals, which cause damage to your cells and weaken your immune system. Load up on garlic, onions, leeks, shallots, and scallions to de-stress and keep the common cold away. Aside from being delicious, low-calorie, and filling, berries are loaded with antioxidants that increase production of killer cells. These killer cells boost your immunity, leaving you healthier and more able to fight off infection. And we all know feeling under the weather causes more stress. Seeds are great sources of magnesium, shown to decrease irritability, lethargy, and depression. Be mindful of portion size though -- seeds are calorie-dense and easy to overeat. A medium banana contains 30% of your recommended daily dose of vitamin B6, which helps your brain pump out mood-lifting serotonin. A medium banana gives you some healthy carbohydrates to combat low blood sugar, which can cause moodiness and irritability. 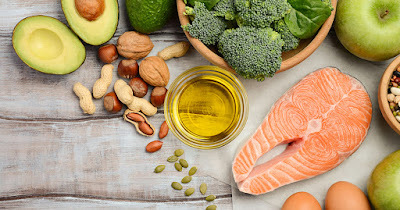 Fatty fish such as salmon, albacore tuna, mackerel, herring, rainbow trout, and sardines are high in omega-3 fats, which can help offset your stress- and anxiety-inducing hormones. Nuts, especially walnuts, have alpha-linolenic acid (ALA), which is an omega-3 fatty acid. ALA, in addition to numerous polyphenols in nuts, have demonstrated the ability to thwart memory loss. Green tea contains L-theanine, an amino acid that can help bolster mental performance, according to the University of Illinois. In clinical studies, chamomile significantly reduced symptoms of anxiety. Additionally, there is some research suggesting that it helps promote sleep, and getting enough sleep is correlated with lower levels of stress. Because oats contain complex carbs, including them in your diet increases your serotonin production. Serotonin helps provide a soothing feeling, helping you conquer stress. Protein foods that contain the amino acid tryptophan help your body make serotonin, a feel-good chemical that controls happiness and overall feelings of wellness. Be sure to include plenty of lean poultry, fish, eggs, beans, nuts, seeds, and tofu. Research has found that zinc can help decrease anxiety, so reach for cashews, oysters, lean beef, yogurt, and lean poultry. Grass-fed beef contains higher amounts of the antioxidants vitamin E, vitamin C, and beta-carotene, as well as omega-3 fatty acids. In studies, people whose diets included more grass-fed beef had higher circulating levels of omega-3 fats (reduce inflammation) and lower levels of omega-6 fats (cause inflammation). Higher levels of omega-3 fats have been shown to boost mood and lower stress.